Dress, Apron & Headscarf plus Tunic, Pants, Belt & Leg Bindings for Genesis for use in Daz Studio 4. Slight wrinkle in headscarf that I cannot get rid of I'm afraid. Several textures included. Movement handles in Dress, Apron & Headscarf. Set Collision for Apron to Dress, the Leg Bindings to Pants. How clever and unique.. hee, cracks me up. Vikings! I love the Viking Shows. Thank you once again. Exactly what I needed :) Thanks! These outfits are very cool! Viking Outfits are wonderful. Also seems kind of amish or something. Great Job, thank you! Reminds me of, Gloranthan, Orlanthi. ;) Nice! Wow - superb clothing set! Thanks a lot! Thank you very much. It's awesome. 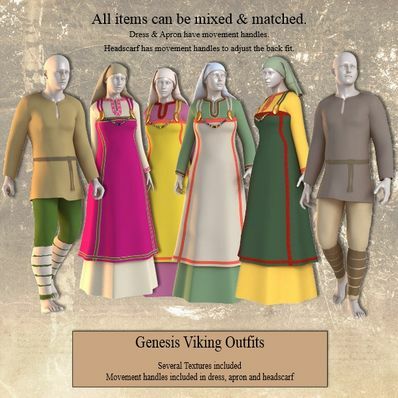 first historically accurate viking clothes i've seen.